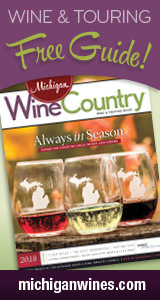 Happy Michigan Wine Month! We're celebrating as we always do: with 30+ days of giveaways, fueled by generous donations by Michigan wineries! Tune in daily May 1-31 (and beyond!) for another chance to win daily. Today's Prize: Tasting for four people, four logo glasses, and a 1¢ bottle of Jezebel wine. Must redeem in person at French Valley Vineyards on Leelanau Peninsula. In her latest HourDetroit.com Michigan wine blog, Cort daydreams about a fantasy holiday wine + food pairing, featuring a few memorable Michigan wines discovered in 2016. Which wines would be included with your fantasy meal? Come chat with us about it!